It launched with much fanfare, but I don’t think it was unreasonable to call Ping a dud out of the gate. While pretty much everyone initially signed up to try it out, a few days later, the activity stream seemed to trickle to almost nothing. And there was a good reason for that: Apple’s social network for music made it very hard to share stuff — you know, be social. But an update today makes it at least a thousand times better. iTunes 10.0.1 released this morning brings some big Ping updates with it. 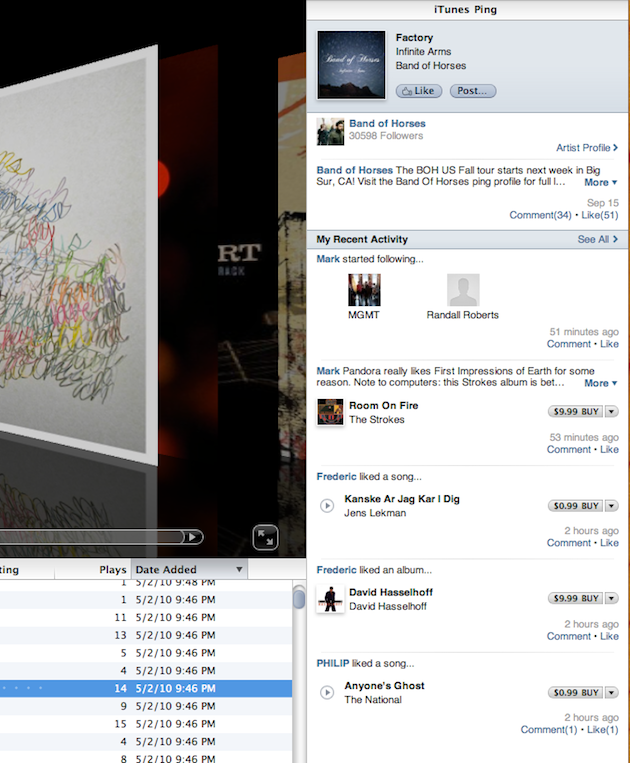 Most notably, you can now use Ping with your own iTunes library. Previously, you could only share songs on Ping through the iTunes Store — a big difference. This basically meant that even if you already owned a song, you had to hunt it down in the iTunes Store to share it. This was almost laughably tedious, and it ensured that no one would use Ping for more than a couple days. If you use the Ping options in this drop down, you can socially share any track you’re actually listening to with the click of a button and it will appear in your Ping stream for all your friends to see. Again, a thousand times better. The iTunes update also brings a new Ping sidebar which also gives you the option to Like or Post any song you have highlighted from your actual library. Below that, you’ll see your Ping stream with all the social activity from your Ping friends. From this sidebar, you can Like or comment on any item in the stream. For the third time, a thousand times better. So is Ping perfect now? Of course not. There is still a ways to go as a social network. But the first release was laughably anti-social as most people spend time in iTunes listening to music they already own and not shopping for new music — or trying to find music they already own to share it via some convoluted method. Apple has fixed that. The next step is for Apple to integrate with the broader social networks — Facebook and Twitter (beyond their current lame way of connecting) — to make their music social network truly viral. 160 million people already have access to iTunes Ping, but it’s still siloed within iTunes. Apple undoubtedly likes that because, well, they like their walled gardens. And it makes any potential shopping experience seamless. But if Ping is going to be a success, they need to get these Ping Likes flowing into Facebook and Twitter too. As we’re all aware, Facebook doesn’t have a music feature — this could be Facebook’s music feature. It could be awesome. Of course, the two sides need to figure out their relationship. Apple also needs to tweak iOS a bit now to get it up to speed with these changes. While the Ping experience through iTunes on iOS was already far superior than on the desktop, they should have a button to Like or Share a song from the music player on iOS devices too. 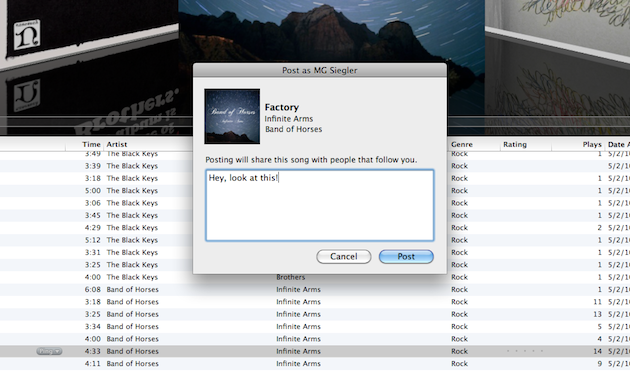 That way, if you’re listening to a song you own and you like it, it’s one click to share. It would also be great if iTunes kept track of the music you actually listen to (like plug-ins by Last.fm and other do) and give you the option to share this data. That way, you don’t have to explicitly share all the time if you don’t want to. And yes, the new Ping still has some social issues with tracks not sold through iTunes — as in, you can’t share those because they don’t exist in Apple’s database. But considering how big the library of tracks they do have is, that’s a relatively minor issue (aside from The Beatles, of course). Today’s update is a solid first step to revive Ping from its early grave.